Congrats to the RoundCube team! The RoudCube application is the new winner of the bi-weekly packaging contest. It has been chosen by our users to be added to the BitNami library. RoundCube is like having your own private GMail: a browser-based multilingual IMAP client with an application-like user interface. It provides full functionality you expect from an e-mail client, including MIME support, address book, folder manipulation, message searching and spell checking. As with all BitNami apps, we will provide free RoundCube installers, virtual machines and cloud images for the Amazon and Windows Azure clouds. Thanks to the community votes, we also recently released Horde Groupware Webmail in BitNami. 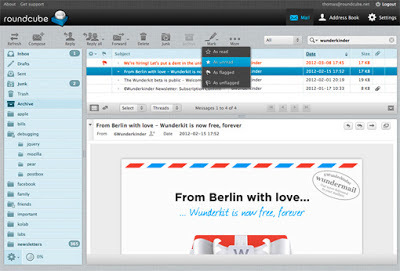 Horde is a browser-based communication suite, where users can read, send and organize email messages and manage and share calendars, contacts, tasks and notes. If you are interested in a Webmail platform you can try Horde easily downloading the Horde Groupware Webmail installers, virtual machines or you can instantly launch a free cloud demo server. Would you like to have your favorite app as part of BitNami? Make sure to suggest and vote for it in our contest!